Having more than 7,000 islands and 20,000 species of plants and animals, the Philippines is one of the 17 mega-biodiverse countries in the world. Yet with all these rich resources, unfortunately the country’s situation is bleak and saddening. More than 50% of old-growth forests in the Philippines are lost. More than 30,000 hectares of mangrove trees are degraded. Families who have been displaced by natural calamities reached more than 900,000. More than 640 species of animals in the country are threatened or endangered. Metro Manila alone produces more than 861,967 tons of trash. And every day, more than 40 incident reports of animal cruelty are reported. Through time, the Philippines underwent changes and improvements due to modernization and development. Yes, many of us live a much easier life, but on the other side of the coin, the situation of the environment went downhill. It was as though we took Mother Earth for granted, forgetting to be mindful of its importance and significance. As Filipinos, we have our Pinoy duty to protect the only home we have before it is too late. Because where else can we live if the earth fades away? In celebration of Write On Track’s (WOT) 5th Year Anniversary, WOT produced a grassroots effort entitled “Juan Earth” as a way of giving back to our planet. Happening on September 29, 2018, at Bonifacio High Street Activity Center, 9th Avenue, Bonifacio Global City (BGC), Taguig City, Write On Track partnered with various non-government organizations (NGO) and schools in making that “Juan” step towards taking action to save Mother Earth. From 10:30 a.m. to 8 p.m., the activity center in BGC will be buzzing with activities. NGOs will have booths, talks, and workshops regarding their group advocacies. Interested individuals can choose and support projects of their likings such as “Adopt-a-Seedling” by Haribon Foundation, “Adopt-a-Pawikan Nest” by SIFCare-CURMA, “Adopt-a-Giant Clam” by University of the Philippines Marine Science Institute: Bolinao Marine Laboratory, and “Adopt Bruno and Katy (Dogs and Cats)” by CARA Welfare. 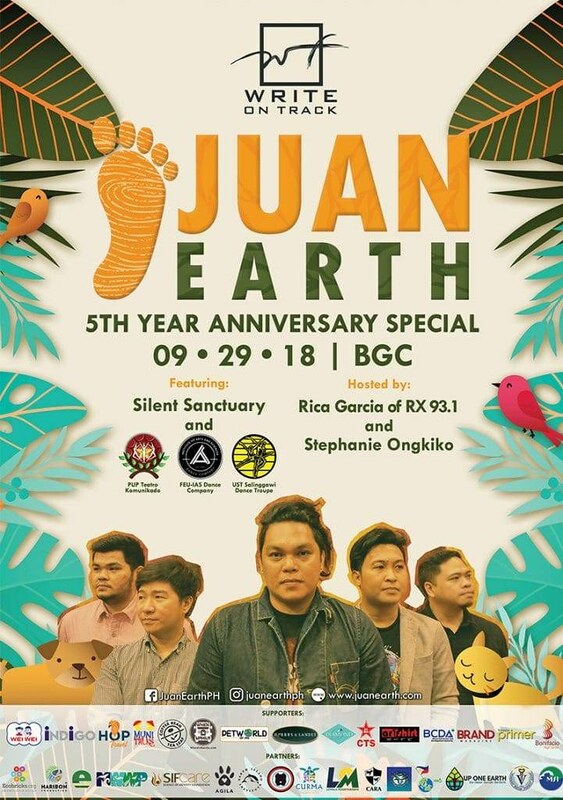 A limited edition Juan Earth shirt will also be given away, in exchange of a used empty plastic bottle or used rubber slipper. Attendees can exchange it at the designated booth. Hosting "Juan Earth" are Renz Ongkiko and Rica Garcia of Monster RX 93.1. Performances from FEU-IAS Dance Company and PUP Teatro Komunikado will add an energetic vibe during the event. And in closing, attendees will be serenaded under the stars by the famous OPM band, Silent Sanctuary.